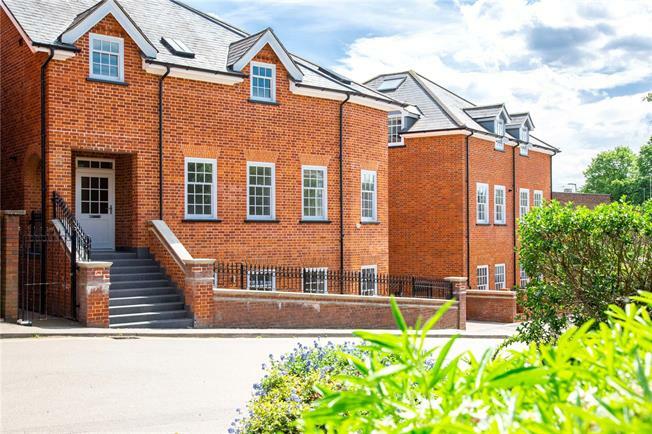 3 Bedroom Flat For Sale in Harpenden for Guide Price £825,000. Approached via its own front door with attractive slate steps at street level leading to a large covered porch, this stunning apartment has spacious and well balanced accommodation comprising a stylish open plan kitchen/living space with high specification kitchen by Brynmor Interiors and with large French doors onto an appealing and generous balcony terrace ideal for al fresco entertaining, there are three bedrooms, with the main bedroom featuring a luxury en suite and French doors onto the balcony. The third bedroom affords great versatility and would easily adapt to a study or snug. 1. Individually designed to maximise the sense of space and natural light. 3. Gas fired boiler with mega flow hot water system. 4. Fitted wardrobes to Master bedroom designed, installed and guaranteed by John Lewis. 5. Chrome finished ironmongery to doors and windows. 6. Walnut contemporary internal doors. 7. Ground floor secure bin store and storage space. 8. Open plan kitchen dining and living areas with beige oak flooring. 10. CCTV around the building. 11. Communal satellite aerial to supply all apartments. 1. Siemens integrated appliances including combination cooker/microwave and fridge freezer. 3. Quooker boiling tap with flexi hose. 4. Integrated dishwasher and compact water softener. 7. Sophisticated styling with Silestone work top, island unit, accents of wood to compliment. 8. LED under cupboard lights. 1. Tiling from the timeless ‘Limestone’ range from Italy supplied by Domus. 3. Bath with overhead and hand shower. 5. Shower with Grohe chrome fittings and clear frameless glass screen. 1. Kitchen, dining and living spaces, beige oak wood planks. 2. All bedrooms carpeted in a light warm grey. This apartment has been designed with smart home solutions in mind. The main living area features a data point which is hard-wired using Cat-6 network cabling to support advancing technology such as enhanced WiFi and Ultra HD 4k video distribution; this provides the perfect platform to support the installation of a bespoke home automation system such as Control 4 and can be easily integrated with platforms such as Alexa, Amazon, Apple TV and Sonos. A central antenna system has been installed to provide each apartment with FM and DAB radio, Freeview, FreeSat/Sky and the option to upgrade to Sky Q and Virgin Media. Pre-wired Bowers & Wilkins ceiling speakers can also be installed as an optional extra to provide high quality, multi-room audio. The lighting scheme has been designed using rimless, plaster-in downlights to achieve a beautiful, seamless appearance. For enhanced safety and security, CCTV cameras have been installed to monitor the building. Furthermore, a video entry system provides a clear view of who is at the front door of each apartment and can be viewed via an app on a tablet or smart phone from the safety of the apartment or from anywhere in the world. FOR CLARIFICATION we would like to point out that the furnishings and carpets shown are not real and have been added to these particulars for illustrative purposes only. If the purchaser requires clarification of any points or considers anything to be critical they should check such specific details with us.